Most infants exposed to HIV-1 in utero and at delivery do not acquire infection. We show that mothers and infants who have CD3-negative cells that respond to HIV-1 peptides are substantially less likely to transmit and acquire infection, respectively. The CD3-negative cells, shown to be NK cells, respond with remarkable specificity and high magnitude to HIV-1 peptides from Env (envelope) and Reg (regulatory) protein regions, as measured by a whole blood intracellular cytokine assay only in the context of HIV-1 infection or exposure. These findings identify an important new measure of protective immunity to HIV-1 that highlights the importance of innate immunity in preventing the establishment of HIV-1 infection. The pivotal role of innate immunity in the instruction of and collaboration with adaptive immunity is only beginning to be appreciated. Innate immune defense pathways are classically distinguished by rapidity of response and “pattern” recognition of pathogens. Epitope specificity and memory are normally attributed to the adaptive compartment. NK cells are important cellular components of innate immunity, and mediating their cytolytic and other functions are an array of receptors that include inhibitory, activating, and accessory receptors (1, 2). HIV-1 infection results in substantial dysregulation of NK cell phenotype and function (3). Host genetic studies suggest an important role for NK cells in the attenuation of disease progression via recognition by killer Ig-related receptors of specific HLA class I molecules (4, 5, 6). Studies of HIV-1-exposed, uninfected adult cohorts also suggest an instrumental role for NK cells in protective immunity (7, 8, 9, 10). To date, NK cells have not been implicated as having a role in maternal-infant HIV-1 transmission. In this study we describe our findings of unusual robust HIV-specific NK (non-T/CD3-negative) cell responses to HIV-1 peptides encountered while studying the role of HIV-specific T cell responses in maternal-infant HIV-1 transmission. 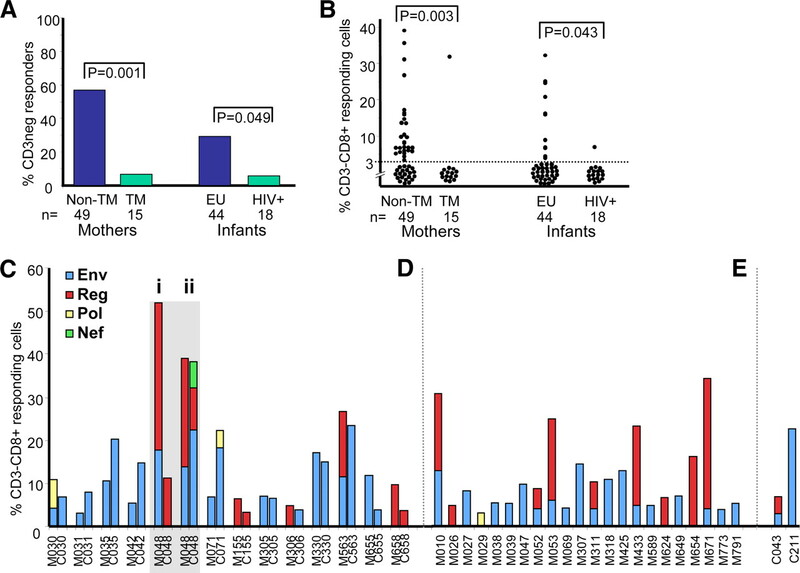 The cohort of HIV-1-infected mothers and their infants followed provides an in vivo quasi-experimental model for investigating immune correlates of protection against HIV-1, providing access to both the transmitter and the recipient of HIV-1 and allowing direct study of those exposed to HIV-1 but who escape infection (11). Heparinized blood samples, collected at birth or at 6–10 wk postdelivery from a total of 79 HIV-infected mothers and 76 of their infants and 20 HIV-1-uninfected mothers and 18 of their uninfected infants, were tested for CD4 and CD8 T cell and CD3-negative cell responses to HIV-1 peptide pools. Women were recruited as part of a study of immunogenetic correlates of mother-to-child HIV-1 transmission (12) and received single-dose nevirapine for prevention of mother-to-child HIV transmission. Of 18 infected infants (transmission rate for the greater cohort of 616 mother-infant pairs was 8.1%), six infants were infected in utero (PCR positive at birth; HIV-1 DNA PCR, Roche Amplicor version 1.5), six intrapartum (PCR negative at birth, positive at 6 wk, no breast feeding), and 6 were first found to be infected at 6 wk but had no birth sample for determining the timing of transmission. HIV-1 RNA levels were quantitated by Roche Amplicor RNA Monitor assay (lower detection limit: 400 HIV-1 RNA copies/ml; Roche Diagnostic Systems). CD4 T cell counts were determined using the FACSCount System (BD Biosciences). The median maternal viral load was 4.07 log10 (2.6–5.69 log; n = 79) and the median CD4 T cell count was 428 cells/μl (range 40–1655 cells/μl; n = 60) for the cohort. Additional HIV-infected women were recruited from the same site to determine whether CD3-negative peptide-responding cells express markers for B cells, monocytes, and T cells (n = 6), NK markers NKp46, intracellular granzyme, and perforin (n = 2) and for plasma transfer experiments (n = 14). This study was approved by the University of the Witwatersrand Committee for Research on Human Subjects; written informed consent was obtained from all of the women. An intracellular cytokine staining (ICS)3 assay measuring both IFN-γ and IL-2 production was performed as previously described (13, 14); an NK Ab against CD56 was included in assays of 50 HIV-infected mothers and 52 infants (subset of the above). Briefly, samples from the mother-child cohort were stimulated with HIV-1 subtype C synthetic peptides in pools representing Gag, Pol, Nef, envelope (Env), and regulatory (Reg) protein regions (Tat, Rev, Vif, Vpu, Vpr and peptides combined). Lymphocyte subsets were analyzed as the percentages of cytokine-positive CD4 T cells (CD3+CD8−), CD8 T cells (CD3+CD8+) cells, and CD3-negative cell subsets were defined as CD3-negative, CD3−CD8−, CD3−CD8+, CD3−CD56+, CD3−CD56+CD8+, and CD3−CD56+CD8−. A positive peptide-induced CD3-negative response was defined as >3% of cells expressing cytokine at a level at least 2-fold above background (this stringent cutoff was used because of variable and, in some individuals, high background stimulation of CD3-negative cells). Whole blood and plasma-depleted blood samples of HIV-1-infected women (n = 14) were washed with PBS, cultures were set up with 50% final volume RPMI 1640 medium or healthy donor plasma (from a single donor selected following comparisons of three healthy donor plasmas), and ICS assays were conducted as described (13, 14) (adding back autologous HIV+ plasma to washed blood showed similar results as for the original whole blood cultures). Serum samples were heat inactivated at 56°C for 30 min to test for a possible role for complement. IgG was purified from plasma (Nab Protein A spin kit; Pierce) and IgG and IgG-depleted fractions were tested for reconstitution of HIV-specific NK responses. In the cohort of 79 mothers, 43 and 22% had CD3-negative responses to Env and Reg, respectively, and these same regions were targeted in smaller proportions of their infants (15.8 and 5.3% of 76 infants) (supplemental Tables S1 and S2).4 Minority targeting by CD3-negative cells occurred against Pol (two mothers and one infant) and Nef (one infant). The narrow targeting of HIV-1 proteins by CD3-negative cells contrasts with the broad targeting of protein regions by T cells. Importantly, no peptide-specific CD3-negative responses could be detected in the HIV-1-uninfected mother or infant controls. CD3-negative responses were highly variable in magnitude between individuals; within individuals they were robust in nature. An example is provided of plots showing CD3-negative responses (CD8+ and CD8−) of a representative mother-infant pair illustrating Env/Reg-induced responses (Fig. 1⇓). Representative flow cytometric plots showing unstimulated and Env or Reg peptide-stimulated, CD3-negative responses. A and B, Mother (M563; top row) and her infant (C563, bottom row) showing low background CD3-negative responses (US, Unstimulated) and responses induced by Env in mother and infant and by Reg in mother only. 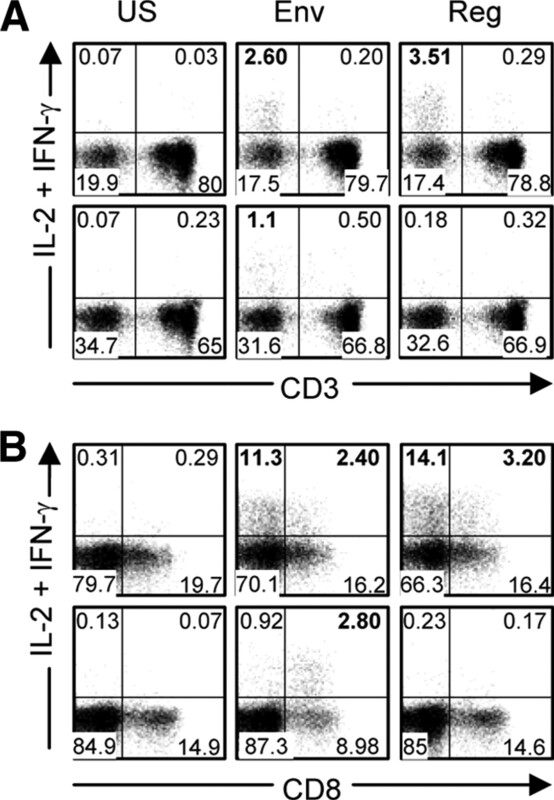 The y-axis shows anti-IL-2-PE plus anti-IFN-γ-PE; anti-IL-2 was included for the detection of T cell responses (IL-2 is not produced by NK cells). The x-axis shows anti-CD3-allophycocyanin (A) and anti-CD8-PerCP (B). Percentages in boldface indicate positive CD3-negative responses in the relevant quadrant. To establish whether HIV peptide-specific CD3-negative responses may be protective in maternal-infant HIV-1 transmission, we compared 49 nontransmitting and 15 transmitting mothers and 44 exposed uninfected and 18 HIV-infected infants (Fig. 2⇓). Twenty-eight of 49 (57.1%) nontransmitting mothers and 13 of 44 (29.5%) exposed uninfected infants had detectable HIV-specific CD3-negative responses. In comparison, one of 15 (6.7%) and one of 18 (5.6%) transmitting mothers and infected infants, respectively, had these responses (p = 0.001 and p = 0.049 for mothers and infants, respectively) (Fig. 2⇓A). Fig. 2⇓B shows an example of the magnitudes of the dominant responses Env and Reg targeted by the CD3−CD8+ cell subset within these same groupings. Adjusting for maternal viral load, the association between the presence of HIV-specific CD3-negative responses in the mothers and transmission remained statistically significant (p = 0.01). No other factors including maternal CD4 count, mode of delivery, infant birth weight, or antiretroviral prophylactic regimens explained the association. Therefore, the presence of CD3-negative responses, most strongly in the mother, was significantly associated with a lack of maternal-infant HIV-1 transmission, suggesting a protective role of HIV-specific, CD3-negative responses within this mode of HIV-1 transmission. HIV-specific CD3-negative responses associate with the outcome of maternal-infant transmission of HIV-1. A, Proportions of nontransmitting (non-TM) and transmitting (TM) mothers and exposed uninfected (EU) and infected (HIV+) infants with CD3-negative responses to HIV-1 peptides. B, Magnitude of CD3-negative responses to HIV-1 peptides among nontransmitting (non-TM) and transmitting (TM) mothers and exposed uninfected (EU) and infected (HIV+) infants. Results are shown for the CD3−CD8+ cell subset where individuals having a response to Env and Reg magnitudes were summated. There were no significant differences between the magnitudes of CD4 or CD8 T cell responses to any HIV-1 peptide pool between nontransmitting and transmitting mothers (p > 0.05). C–E, Proportions of CD3-CD8+ cells responding to specific HIV-1 peptide pools (Env, Reg, Pol, and Nef) among 13 mother-infant pairs where both mother (M) and child (C) displayed positive responses (C), 22 mothers whose infants were nonresponders (D), and two infants whose mothers were nonresponders (E). One mother-infant-responding pair (M-C048) was tested at delivery (i) and at 6-wk postdelivery (ii). M671was a transmitting mother with a response (infant had no response) and C043 was an intrapartum-infected infant with a response (mother had no response). More than one-third (37%) of the HIV-infected mothers with HIV-specific CD3-negative responses had infants with detectable responses (Fig. 2⇑C). All of the concordant responders were nontransmitters, but one of 22 responder mothers who had nonresponder infants was a transmitter (Fig. 2⇑D), and of two responding infants with nonresponder mothers, one was an infection-acquired intrapartum (Fig. 2⇑E). Notably, the mother of the only infected infant with a response (low Env and Reg CD3-negative response) was a CD3-negative nonresponder and had among the highest viral load (460,000 RNA copies/ml) and lowest CD4 T cell count (81 cells/μl) of all the transmitting mothers. Where paired mothers and infants both had responses there was similarity in protein targeting, with a few pairs showing additional or different regions targeted in one and not the other (M-C030, M-C048i, M-C048ii, M-C071, M-C306, and M-C563, where M stands for mother and C stands for child) (Fig. 2⇑C). The M-C pair with two consecutive samples showed that the mother maintained the same Env and Reg responses at both time points, whereas her infant showed only a Reg response at birth that developed into a response to Env, Reg, and Nef at 6 wk. Responses to Env were usually (seven of 10) of higher magnitude in the infant than in the mother, whereas the reverse was true for shared responses targeting Reg. This suggests that the less frequent detection of HIV-specific CD3-negative responses among infants was unlikely to be due to reduced sensitivity of detection among infants. The maturation state of NK cells and their immune capability may be different in the subset of infants that responded. Once we started to observe the consistent occurrence of peptide-specific CD3-negative responses in our cohort, anti-CD56 was included as a marker for NK cells in 50 HIV-1 infected mothers and 52 infants. Through further flow cytometric analyses and review of the above results, we inferred that the HIV-specific CD3-negative cells are NK cells based on the following criteria: 1) the responding CD3-negative subsets do not contain B cell (CD19) or monocyte markers (CD14) and gated monocytes do not produce IFN-γ in the ICS assay; 2) CD3-negative cell subset responses all correlate positively and significantly when comparing the same protein region responses across the CD8+ and CD8− subsets, with or without the CD56 marker, suggesting that it is highly likely these CD8+ and CD8− subsets are cells from the same cell type that respond similarly to specific peptides; 3) CD69, an early activation marker that correlates with cytotoxic activity, is expressed on all HIV-specific IFN-γ expressing CD3-negative cells (tested for the first 29 HIV-1 infected mothers and 24 infants in which the CD56 marker was not included); 4) responding CD56+ cells are CD56dim, suggesting that they are cytotoxic NK cells (15) and stain for intracellular perforin and granzyme; and 5) IFN-γ-producing CD3-negative cells express NKp46, an NK cell receptor present on all NK cells (1) (data not shown). These HIV-specific NK responses could not be detected in the absence of patient plasma but could be reconstituted when either patient plasma or healthy donor plasma was added back (Fig. 3⇓). Heat-inactivated serum had no effect, ruling out a role for complement in these responses. The necessary nonspecific plasma component required for successful ex vivo detection of these responses resided in the IgG-depleted fraction of healthy donor plasma (data not shown). These findings explain why these particular responses have been so elusive in their detection, given that T cell responses to HIV-1 peptides have been very widely studied but conducted mainly on isolated PBMC. Representative flow cytometric plots following gating of CD3-negative cells from an HIV-1-infected patient (viral load 2730 RNA copies/ml; CD4, 633/μ1) showing IFN-γ-expressing CD56+ NK cells in unstimulated (US) and Env peptide pool-stimulated whole blood (A), washed whole blood cultures with RPMI 1640 medium added back (50%; v/v) (B), and washed blood cultures with plasma from a healthy uninfected donor added back (50%; v/v) showing reconstitution of the Env response (C). One of 14 independent experiments is shown (eight CD3-negative responders and six CD3-negative nonresponders); nonresponders did not show reconstitution of any HIV-specific response with the addition of uninfected plasma. 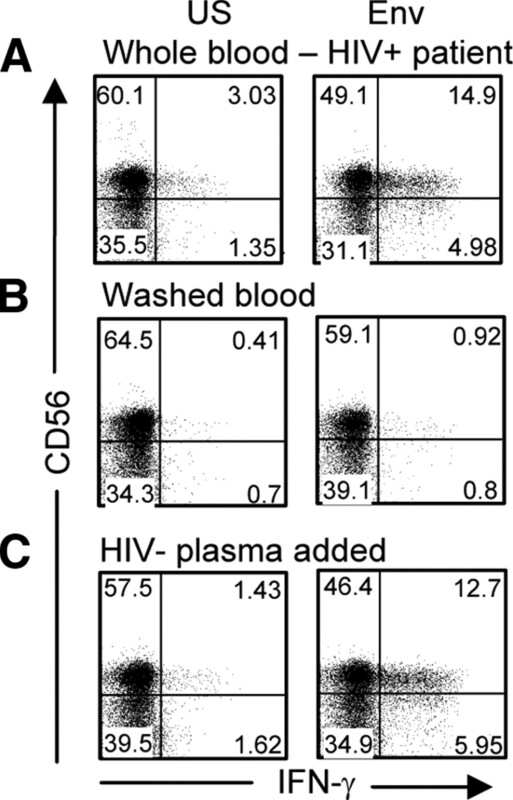 The response in this example had a magnitude of 18.48% CD3−CD56+IFN-γ+ (A), was reduced to 0.9% (B), and then reconstituted to 19.06% (C) with the addition of healthy donor plasma. The absence of these responses among uninfected controls suggests that the responses are not due to a direct process of peptide binding to cell surface receptors and triggering of these innate immune cells. Their detection in the context of HIV-1 exposure among uninfected infants indicates that detectable antigenic load is not required in vivo. Taken together, these results support a hypothesis of a “memory” type response. If this is indeed found to be the case, this would represent the first such report that indicates the possibility of NK cell “memory” in humans. The possibility that NK cells may well have memory of previous exposures to Ag is supported by data using a mouse model of contact hypersensitivity (16), and very recently one of murine CMV infection (17). Interestingly, the latter study shows that newborn mice receiving adoptively transferred “memory” NK cells had greater protection against subsequent infection with murine CMV than that provided by the transfer of naive NK cells (17). Passive transfer of adaptive maternal Abs to the infant would provide another plausible explanation for detection of these responses, thus providing memory from the mother’s HIV-1 exposure. However, NK-responding mothers with and without responder infants did not differ in CD4 T cell count or in viral load (p > 0.05), factors that may be expected to influence passive transfer of Abs (18). A recent study (19) reported similar HIV-specific NK responses in HIV-1-infected adults to be mediated by HIV-specific IgG, most likely through its binding to CD16. However, our findings implicate a mechanism not involving HIV-specific IgG but rather a nonspecific plasma factor. They also reported low background stimulation and their responding cells were CD8-negative, whereas ours included dim CD8-positive (a difference that could be explained by use of different Abs). We propose that the differences seen are related to technical, population, or environmental differences, suggesting that the thresholds required for activation of NK cells may differ in such a way as to allow one mechanism to take precedence over another. The peptide-specific, CD3-negative responses were also detected in some HIV-1 infected women who did not have CD4 or CD8 T cell responses to the peptide pool to which CD3-negative cells responded, and all infants with HIV-specific CD3-negative responses had no detectable CD4 or CD8 T cell responses. Thus, HIV-1-specific T cells were not responsible for the bystander activation of NK cells via any mechanism such as the production of the NK-activating cytokine IL-2 as has been shown for influenza-induced IFN-γ production in NK cells (20). This does not preclude the importance of T cells in further enhancing NK responses in cases where individuals have both T and NK cell responses to the same peptide pool. Bystander activation by cytokines otherwise secreted by peptide-specific T cells would largely be inhibited due to the addition of brefeldin A in our assay, which allows for intracellular cytokine accumulation for detection purposes. Furthermore, in vivo T cell responses to regions such as Gag may further enhance responses of NK cells to regions such as Env or Reg or vice versa. Cytokines elaborated by activated NK cells are known to play a role in the subsequent development of acquired immune responses. It is noteworthy that the NK responses we detected mainly target the more variable proteins of HIV-1. This is reminiscent of T cell responses in the acute HIV-1 infection of adults and perinatally infected infants where the responses predominantly target variable (Nef, Reg, and Env) rather than conserved proteins (Gag and Pol). However, although conserved proteins are more readily targeted by T cells during chronic infection, results from this study show that NK responses are against the more variable proteins, Env and Reg. Using smaller Reg region peptide pools and by mapping individual peptide responses across the HIV-1 genome (13), we have identified Vpu and Tat as the Reg regions targeted by NK cells (supplemental Fig. S1). Acutely infected infants display HIV-specific T cell responses (CD8 and CD4 T cell responses in 100 and 33% of infected infants, respectively), mainly to variable proteins (21), whereas HIV-specific NK responses are predominantly found in infants who are not HIV-1 infected. We propose that these early robust innate responses reflect what NK cells “see” in exposure and early infection and that NK cells maintain a similar capacity for recognition of the variable regions, whereas the T cell “view” broadens in favor of detecting conserved proteins. Our data provide strong support for a significant role of unusual NK responses elicited in the presence of HIV-1 peptides in the prevention of maternal-infant HIV-1 transmission. The mechanisms underlying the interactions of viruses and NK cells are undoubtedly complex, and it is the collective understanding of these interactions that will contribute to much needed new approaches that use NK cells as effector cells in early exposure to HIV-1, particularly if these cells might possess the capability of memory to antigenic exposures. We thank technical and clinical staff for their valuable contributions. ↵1 This study was supported in part by the South African AIDS Vaccine Initiative, the National Institute for Child Health and Human Development (Grant 42402), and the Wellcome Trust. C.T.T. is a Wellcome Trust International Senior Research Fellow (076352/Z/05/Z). ↵3 Abbreviations used in this paper: ICS, intracellular cytokine staining; Env, envelope (protein); Reg, regulatory (protein). Biassoni, R., C. Cantoni, D. Pende, S. Sivori, S. Parolini, M. Vitale, C. Bottino, A. Moretta. 2001. Human natural killer cell receptors and co-receptors. Immunol. Rev. 181: 203-214. Gaudieri, S., D. DeSantis, E. McKinnon, C. Moore, D. Nolan, C. S. Witt, S. A. Mallal, F. T. Christiansen. 2005. Killer immunoglobulin-like receptors and HLA act both independently and synergistically to modify HIV disease progression. Genes Immun. 6: 683-690. Scott-Algara, D., L. X. Truong, P. Versmisse, A. David, T. T. Luong, N. V. Nguyen, I. Theodorou, F. Barre-Sinoussi, G. Pancino. 2003. Cutting edge: increased NK cell activity in HIV-1-exposed but uninfected Vietnamese intravascular drug users. J. Immunol. 171: 5663-5667. Montoya, C. J., P. A. Velilla, C. Chougnet, A. L. Landay, M. T. Rugeles. 2006. Increased IFN-γ production by NK and CD3+/CD56+ cells in sexually HIV-1-exposed but uninfected individuals. Clin. Immunol. 120: 138-146. Tiemessen, C. T., L. Kuhn. 2007. CC chemokines and protective immunity: insights gained from mother-to-child transmission of HIV. Nat. Immunol. 8: 219-222. Kuhn, L., D. B. Schramm, S. Donninger, S. Meddows-Taylor, A. H. Coovadia, G. G. Sherman, G. E. Gray, C. T. Tiemessen. 2007. African infants’ CCL3 gene copies influence perinatal HIV transmission in the absence of maternal nevirapine. Aids 21: 1753-1761. Meddows-Taylor, S., S. Shalekoff, L. Kuhn, G. E. Gray, C. T. Tiemessen. 2007. Development of a whole blood intracellular cytokine staining assay for mapping CD4+ and CD8+ T-cell responses across the HIV-1 genome. J. Virol. Methods 144: 115-121. Shalekoff, S., S. Meddows-Taylor, D. B. Schramm, S. L. Donninger, G. E. Gray, G. G. Sherman, A. H. Coovadia, L. Kuhn, C. T. Tiemessen. 2008. Host CCL3L1 gene copy number in relation to HIV-1-specific CD4+ and CD8+ T-cell responses and viral load in South African women. J. Acquir. Immune Defic. Syndr. 148: 245-254.
Cooper, M. A., T. A. Fehniger, M. A. Caligiuri. 2001. The biology of human natural killer-cell subsets. Trends Immunol. 22: 633-640. O'Leary, J. G., M. Goodarzi, D. L. Drayton, U. H. von Andrian. 2006. T cell- and B cell-independent adaptive immunity mediated by natural killer cells. Nat. Immunol. 7: 507-516. Sun, J. C., J. N. Beilke, L. L. Lanier. 2009. Adaptive immune features of natural killer cells. Nature 457: 557-561.
de Moraes-Pinto, M. I., A. C. Almeida, G. Kenj, T. E. Filgueiras, W. Tobias, A. M. Santos, M. M. Carneiro-Sampaio, C. K. Farhat, P. J. Milligan, P. M. Johnson, C. A. Hart. 1996. Placental transfer and maternally acquired neonatal IgG immunity in human immunodeficiency virus infection. J. Infect. Dis. 173: 1077-1084. Stratov, I., A. Chung, S. J. Kent. 2008. Robust NK cell-mediated human immunodeficiency virus (HIV)-specific antibody-dependent responses in HIV-infected subjects. J. Virol. 82: 5450-5459. He, X. S., M. Draghi, K. Mahmood, T. H. Holmes, G. W. Kemble, C. L. Dekker, A. M. Arvin, P. Parham, H. B. Greenberg. 2004. T cell-dependent production of IFN-γ by NK cells in response to influenza A virus. J. Clin. Invest. 114: 1812-1819. Shalekoff, S., S. Meddows-Taylor, G. E. Gray, G. G. Sherman, A. H. Coovadia, L. Kuhn, C. T. Tiemessen. 2009. Identification of human immunodeficiency virus-1 specific CD8+ and CD4+ T cell responses in perinatally infected infants and their mothers. AIDS 27: 789-798.